and see all these amazing creations. the design, the balck and white photos-- all of it! Another one of Jenny's awesome pages! !..Love all the cute embellishments around those sweet smiles!! Congrats Jenny :-) Wonderful choice! Love this LO, great use of the CC pps, love how everything just pops right off of the cs bg and how your b/w pics just really stand out! BEAUTIFUL choice my friend! 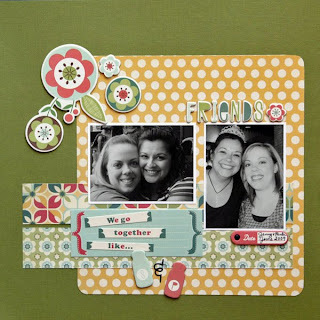 This is an amazing layout Jenny!! Hey! I know those pretty faces! Wonderfully bright cheery LO!! Congrats Jenny! I love this layout!! So nice and cheerful.